By Leah Dobrinska. Oct 31, 2015. 9:00 AM. Happy Halloween! We hope you’re able to share some tricks and treats with those you love today. In honor of the festivities, we thought we’d compile a list of some of the top Halloween children’s books. Snuggle up with your little ones and one or more of these favorites after a successful night of trick-or-treating, and you’re sure to round out your day in the best possible way. 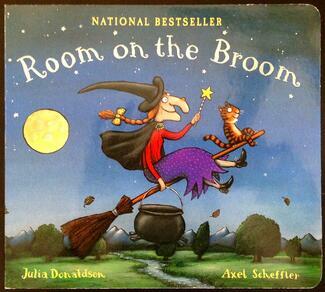 Room on the Broom is a fun, light-hearted Halloween story about a witch and her cat, happily riding on their broom. The wind blows off the witch’s hat, then her hair bow, and then she accidentally drops her wand. In each case, a helpful animal returns the witch’s possessions in exchange for a ride on her broom. The broom gets mighty full and then...! Well, I won't spoil it for you. Donaldson masters simple, yet utterly appealing metrical lyrics. The repetition is great for engaging young ones, and the lessons in the story prove subtle, yet valuable. Likewise, Axel Scheffler’s illustrations expertly convey the emotions of the characters. The witch's facial expressions are perfection. This book is truly a great ride, for children listeners and adult readers, alike. Doreen Cronin, the author who brought us the Caldecott Honor book, Click, Clack, Moo: Cows That Type, has a masterful way of using language and humor on Farmer Brown’s farm to weave tales that keep us coming back for more. Click, Clack, Boo is a humorous and delightful story of the Halloween antics that go down on Farmer Brown’s Farm. Poor Farmer Brown can’t catch a break, especially on the holiday that he so very much despises. He tries to turn in early, but his animals have other plans. Cronin’s writing is delectable and interactive (the onomatopoeia is ridiculously fun), and illustrator Betsy Lewin’s watercolors make the spooky, barnyard animal party come to life in the best possible way. 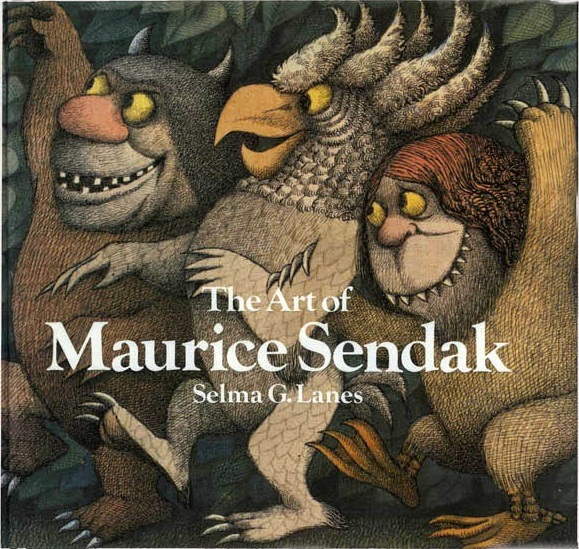 We know, we know, Where the Wild Things Are isn’t technically a Halloween book, but Maurice Sendak’s classic just seems to fit on this list. After all, Max does don his wolf costume to set off the whole sequence of events, and the magical journey Sendak takes us on throughout the rest of the story makes it a great book to cap off a crisp fall night of trick-or-treating, apple bobbing, and other notable “wild things.” Voted the number one children’s picture book numerous times, there’s a good reason Where the Wild Things Are is included on a whole myriad of our lists. The Duck and Goose series from Tad Hills is one of our current favorites. 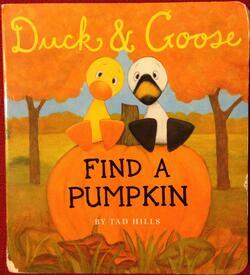 In this installment, you can join Duck and Goose as they search for the perfect pumpkin. With a little help from their friend Thistle, the two pals are able to seek out a good one, but not before searching up in the apple tree, in the pond, in the leaf pile, and on top of the stump, among other places, and coming up short in each case. The dialogue between Duck and Goose, which takes the form of an alternating call and response, is easy to follow for small children, and the pumpkin quest will keep little readers and listeners entertained and engaged. For our final book pick, we look to Roald Dahl. The man’s taste is spot-on, and he collected his own favorite 14 ghost stories and placed them together in this book. This selection is definitely only suitable for older children, as Dahl did not skimp on the spookiness. 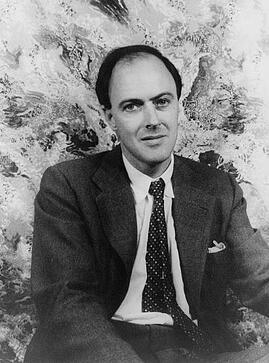 The introduction of this book reveals that Dahl read nearly 750 ghost tales before settling on his selection, and he said a really good ghost story “should give you the creeps and disturb your thoughts.” In this collection, you’ll find tales from Marion Crawford, Edith Wharton, and Jonas Lie, among others. Go forth, and prepare to be spooked! Some honoroable mentions? Five Little Pumpkins, a classic nursery rhyme. And for the fall season, The Story of Johnny Appleseed, of which there are numerous versions. Which of your favorite Halloween books for children did we miss? Share them with us in the comment section below.